We have delivered both weekend trips away and Out & Abouts (Saturday or Sunday outings and activities) offering opportunities to socialise and have a lot of fun! SNAP provide leisure and recreational opportunities for young people in the Inverness area who all have a learning disability and additional support needs. We provided grants directly to carers who live in the Highlands. The First Step Initiative project supported young carers affected by parental substance misuse take part in a residential activity weekend on the Isle of Skye. The project ran in partnership with Connecting Young Carers and allowed the young people time to learn more about themselves developing healthy coping mechanisms for the future. Camp & Trek was founded with the aim of offering opportunities to participate in outdoor adventurous activities to disadvantaged young people. We reach out to young people who either through poverty, neglect, family breakdown, too much responsibility at an early age, learning difficulties or physical disabilities have limited access to the Great Outdoors. Connecting Young Carers is a Highland wide organisation that works to raise awareness, identification and support for Young Carers. The Watermill Wheelers is a cycling club for cyclists with a disability. We established a club for children, young adults and their carers in the Highlands and Moray using cycles. 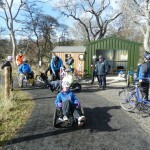 Both adapted and ordinary cycles at the Highland Cycle Ability Centre (Riding for the Disabled using cycles!). 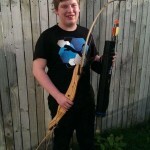 We worked with 9 young people with an Autistic Spectrum Disorder, involving them in outdoor activity breaks (camps). The length of the breaks depended on the needs of each young person but included short sessions of up to half a day. A day’s activity, overnight stay and activities, weekend breaks and for one young person a five day camp. We provided grants directly to carers who care for a child who has Down’s Syndrome and who live with them.